Somehow in my life, nothing ever quite happens exactly as I expect or plan it. My admission to a doctoral degree program is no different. I was originally anticipating enrolling in a doctoral program in Fall 2019 after spending a full year evaluating my options. Now I am admitted to the PhD in Educational Research, Measurement and Evaluation (ERME) for Spring 2019. There are several layers of background that contribute to how I have arrived at this current situation. I had a lot of trouble figuring out where I fit in academically. I have interests in a lot of different disciplines, ranging from philosophy to technology and a variety of social and artistic stops between. I looked at programs like Public Policy and Organizational Science, I found them to be empty and cold. I had previously had 2 courses in the department of Educational Leadership, a survey design class and a course about the basics of instructional design. I enjoyed both courses, so I took a chance on another class, Applied Research Methods. Through that class I became familiar with the graduate director for the Educational Research, Measurement and Evaluation program. Through that class I became more interested in the parallels between educational research and social research. One of the most interesting things was that educational research spans all sorts of systems for analysis. Single case research like is found in psychology, phenomenological research as is found in philosophy and institutional/societal research as is found in sociology. For a lack of a better way of phrasing it – academically, I was home. The further complication for me was that the department offers 3 doctoral programs of interest to me – EDD Educational Leadership in Higher Education, EDD Educaitonal Leadership in Learning, Design and Technology and the PhD in ERME. In addition, each of those degrees could be paired with one or more certificates. There are a lot of possibilities to design an overall curriculum in the area. With all of these possibilities, why did I select educational research? While both of the EDD programs hold an interest for me, each is much more narrowly designed than I feel I would be happy with. I do not seek to be purely a “leader” nor do I want to be purely an instructional designer. The PhD is 12 hours more and a lot more research intensive than the either of the EDD programs, but the curriculum is more flexible so I can design it to be what I need. There is also a bit of challenge to the PhD curriculum for me. I mentioned that it is more research intensive, well, in terms of analysis methodologies, that has always been a zone of weakness for me. I struggled with quantitative analysis in the Sociology MA, barely grasping the concepts. I feel as though I have matured quite a bit intellectually since that course and am excited to take on the new challenge of learning more advanced analysis skills. The educational leadership department generally is methodologically open, so I would not have to go with a quantitative approach for my dissertation, in fact I could do a mixed methods dissertation if I preferred. So, how did Fall 2019 become Spring 2019? An odd bit of e-mail exchanges and both myself and the graduate director being eager. Last Monday (December 17th) I sent a series of questions about the application. Upon reviewing those questions (and my DegreeWorks profile) the director noticed that I had enrolled for courses that count in the program for spring. Initially I was taking one of the courses, Program Evaluation, because it applies to my job. The other course I was taking mostly for fun, but it also could apply to the program. After confirming my intentions the graduate director asked me to turn in my application as soon as possible. That was last Tuesday (December 18th). By Wednesday (December 19th) my application was submitted. On Thursday (December 20th) morning I was invited to interview with the admissions committee at 10am. It was a brief 30 minute interview, which took only about 39 minutes. On Friday morning (December 21st) I woke up to an email from the graduate director informing me of the committee’s decision to recommend me for admission. By the afternoon I had received communication from the graduate school asking me to confirm my intention to enroll. I responded almost immediately. So, a week ago I had not submitted an application to the PhD program, but now, less than a week after submitting the application, I am an admitted doctoral student. My first classes officially in the program will begin on January 9th. It has been quite an adventurous week of unexpected events, but somehow, based on my academic history, really doesn’t come as a surprise to me that I was admitted in such a way. December 24, 2018 CurtisComments are off for this post. Last January I bought a Nikon F6, the most advanced film SLR camera ever created. Over the past few weeks I have been tracking down a Nikon F, Nikon’s original film SLR, camera on eBay. The F6 has fully electronic control and a self-diagnosing shutter. The F is fully mechanical and is not at all self-aware. I am obsessed with the F6’s ability to capture data about exposures and write information to a CF card and to the film itself. So, why would I want a Nikon F? For me the Nikon F represents a certain beginning to modern photography. Since the end of the Kodak APS era I have been a Nikon user and have fully adopted the Nikon culture (not to mention the F-mount lens system). I can’t say that its nostalgia because I wasn’t alive with the Nikon F was released, but there is a desire to touch history and to experience using a fully manual camera, learning to calculate exposure values and becoming more aware of the dynamics of focus selection. I also have some apprehension about approaching a method of photography that has absolutely no electronic assistance or guide, which I have been dependent on since I began photography when I was 5. My Nikon F is due to arrive around April 4th. March 26, 2017 March 27, 2017 CurtisComments are off for this post. I have been fascinated by IR photography since I first figured out what it was. I started off as a digital camera brat, so most of my experiences were with really slow shutter speeds on a sensor mostly protected from IR light. Since returning to film I have gotten back into IR and find that it is both frustrating and fun to work with. Until recently my only extended red film has been Ilford’s SFX 200, which is a just barely IR sensitive film (720nm). I have recently discovered Rolleri’s series of films, most of which are more sensitive to red than Ilford’s standard films. 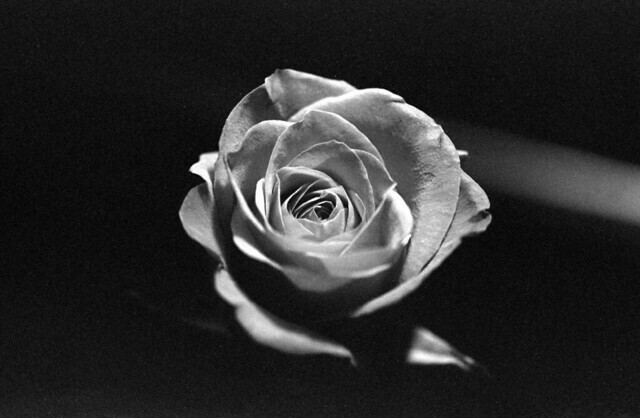 Their IR 400 film, which is sensitive to 820nm, has a greater range than anything I’ve worked with before. 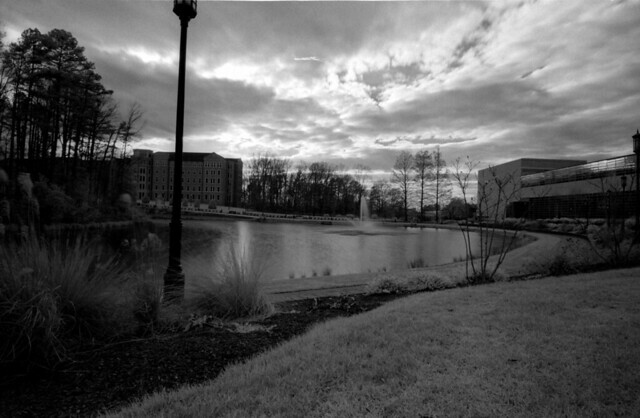 For my test roll I experimented a lot with exposure settings as IR is very different for metering from visible light. For SFX 200 I have to reduce the metered speed by several stops for a good exposure. IR 400 is not quite as sensitive and seems to require several stops of increase to avoid a dark image. Overall I am impressed with some of the results I have gotten with IR 400 on the test roll, but am looking forward to seeing more of the results that I get when I develop my second roll now that I have more of an idea of the type of exposure levels that work well with the film. February 25, 2017 February 25, 2017 CurtisComments are off for this post. I started the ExIf 35 project (http://exif35.pcfire.net) in 2010 when I returned to shooting film. Perhaps I’m metadata obsessed, or just crazy, but I decided I wanted good ExIf data on my scans of film photos. In the six years since I started the project I allowed myself to reach a point where I felt that ExIf 35 was “complete”, it did what it needed to do, usually pretty well. I made no major changes to the software since 2012 (see: http://exif35.pcfire.net/viewnotes.php) and I drifted somewhat away from film photography as a hobby and art again. This spring I purchased a Nikon F6 camera and dove right back in just as deep as I had been before with film photography – the only difference is that the F6 does a bit of its own metadata recording, which makes having a metadata/ExIf workflow even more important. Since the Nikon F6 was released in 2004 many of its accessories (MV-1) are no longer made and its intended software no longer functions in the modern era, so I had to seek out other alternatives and build new things into ExIf 35 to accommodate my needs. When I speak of “my needs”, I refer of course to the fact that I record information beyond basic ExIf data. I like to record things like photographic filters in use and details about how the film was developed (see: http://exif35.pcfire.net/docs.php?doc=xmpSpec for a complete list of my special fields). Yesterday in a fit of boredom between semesters I began looking at some of my data in Exif as it was stored in Flickr. I realized that there was no degree symbol in my develop temperatures (20 C vs. 20° C), so I started tinkering with the data writing process, only to find out that putting that character in one location in the file (Exif:ImageDescription) caused Flickr to corrupt the field when it is displayed. In an effort to correct the problem I began looking at the field in other applications (ACDSee, PhotoMe, etc). I discovered two things 1) There is nothing wrong with the bloody thing and 2) There are a few new ExIf fields that I had not seen before. This led me to the ExIf documentation (http://www.cipa.jp/std/documents/e/DC-008-Translation-2016-E.pdf). Many of the fields that were added in 2012 to version 2.3 and in 2016 to version 2.31 are fields related to sensitivity speed and sensitivity type. Most notably, ISO is no longer the only way to measure sensitivity. While I doubt I will use anything else, this represents a bit of an evolution in the way that metadata capture on imaging devices is represented. The addition of fields such as PhotographicSensitivity, RecommendedExposureIndex and a new ISOSpeed field expand options for the level of detail that is recorded for film sensitivity, although the creators of ExIf intended such fields for describing electronic sensors and their gain ranges – funny how those parallels between digital and film are maintained after all this time. When I first read about those fields my first thought was a very quirky film called Ilford Delta 3200. This film is marketed (recommended, even encouraged in DX) to be ISO 3200. The actual film speed is ISO 1000. The film is regularly shot anywhere from ISO 800 to ISO 6400 (some claim it can push to 12,800). Once I figure out what each of these fields does in practice (through reading them in a variety of applications) and maybe through reading ISO specification 12232 I will be better prepared to use these fields to accomplish my goals. Some of the new fields relate to details of the camera and lens configuration used – these I am already implementing as they are clearly defined. I feel that I need to re-evaluate ExIf 35 because there are a lot of gaps in what it logs to files, what is collected from users and perhaps some difficulties with the way that it writes data in general. I have been away from the project for too long and have only added fields on occasion. The overall functionality of the application needs to be checked for compliance with modern standards as I implemented my ExIf writing in an experimental way, guessing at how things worked and then leaving things in place once they worked, which is perhaps not the best way to approach something as intricate as metadata. There are also fields that I have not tested in detail how they work, which may also introduce problems that cause some applications to not read the file accurately. The addition of new fields such as time zone offset present cases where the UI and the data storage (preferences and defaults) functions need to change to match the expectations of the standards. Adding the new ISO fields I mentioned before will require a change to the handling of recording ISO data, such as I will need new fields in the form to collect the data and will need to establish logic to ensure that all of the data is recorded accurately and consistently even with those fields are not filled out (very often I shoot and develop my standard film, HP5+, at its DX speed, so assuming the other values is fine). The project, and its documentation, are long overdue to be refreshed. There are many areas I have patched in new fields or extended functionality without reworking the workflow or the ExIf encoding process. December 29, 2016 February 12, 2017 CurtisComments are off for this post. I have read Ken Rockwell’s reviews of lenses for years before buying them, and aside from his necessary self-promotion at the end of each review, I’ve found his site quite informative and helpful. Last evening I ran across his post entitled ‘Why We Love Film’ (http://www.kenrockwell.com/tech/why-we-love-film.htm) and found myself approaching the post as a dual-medium shooter (film + digital) and feeling the need to pick apart some of his biases. Overall the content of the article is interesting and would be very informative to someone who has never shot film before, but for the truly religious digital shooter, it is offensive and off-putting. Mr. Rockwell directly insults those individuals, so if he was hoping to convert a few people or at least encourage experimentation I think he may be having the opposite effect. The article comes across as a bit nostalgic at the beginning, referencing his 1956 Kodak that ‘does not need batteries’. This does not seem relevant as newer Nikon film cameras will run for a year or more on two batteries. The low power consumption is not universal to film though, as the F5 requires 8 AA batteries. Sure you can just throw them out and replace them, but ultimately in this age we are more likely to put them in a charger and plug them into the wall at night! Its the same thing, just a different medium. Again, Mr. Rockwell seems attached to the nostalgia of a camera that does not require batteries, but yet I fear that even if Nikon’s next Pro D-SLR ran on solar power, he would still not be satisfied on this option. It is not the film medium that Mr. Rockwell is advocating for, but rather a much simpler era in photographic history. An area where Mr. Rockwell and I are in complete agreement is the lack of an LCD being a very positive for a photographer’s focus. It is easier to think about the next shot when you aren’t reviewing and in too many cases its too easy to look at the display and doubt yourself. I think this is more of an issue for amateur photographers and for complete nerds (who would NEVER consider film as a viable medium). I think experienced photographers get over this need to check themselves, especially sports photographers who DO realize that there is no time to waste with image review. Also, Nikon’s D-SLRs have a great option for this – IMAGE REVIEW: OFF. As for Mr. Rockwell’s safety jab, well, I don’t know what moron crosses the road looking at the screen of their SLR, but it seems today people are in much greater danger with crossing the street with cell phones. In another article Mr. Rockwell mentions that since he was 10 years old he has been writing down the exposure settings of every frame. In his review of the F6 he mentions that this is taken care of by the camera itself and he can just download the data for storing with his frames, but wait, the Nikon F6 requires… BATTERIES! Mr. Rockwell seems off-put by computers and their ‘time wasting’ capabilities, but that feature of the F6 he loves so much does require a computer, whether you use a Nikon MV-1 adapter or a Meta35 USB device. Mr. Rockwell addresses the color range of film. Yes, film range is natively awesome (assuming it is processed correctly and assuming your exposure was perfect), but the key problem with digital cameras is not their lack of range on the sensor, but instead the lack of range provided by the various compression formats. Shooting a Nikon D750 in RAW will give you a single file that is perfectly capable of expressing wide range, it just requires a little work to make it visible electronically (tone mapping primarily). What good is the range of film if the only way to share it with someone is in person? I suppose this calls back to what is the purpose of the medium in general. If photography is to be an intimate expression of lived moments with others who were there, then yes, this makes sense, but if the purpose of photography is to be archival and to be shared, then the limitations of range being expressed only in the original format is lacking in this goal. One topic upon which I will not argue with Mr. Rockwell – film grain looks better than digital ‘grain’. Film in its multi-layered emulsion is an organic creation, there is no set pattern of how the grain falls. Film images are cleaner and feel less hazy because they don’t have an unnatural grain as a result of sensor noise. I think eventually digital technology will get there, especially with the improvements in high ISO performance, but will it ever meet the comforting feel of a film grain? I really don’t know. Ironically, despite my critique of Mr. Rockwell’s article, I decided to buy an F6 instead of an F5 because it requires less battery power and will keep details of my shots electronically, freeing me to focus more on the image. January 20, 2016 February 12, 2017 CurtisComments are off for this post. There is still a lot to do, including pulling in sociology of culture materials and gradually fleshing out the sociology of the Internet stuff, but this at least puts me on track to begin writing about the topic and thinking about it sociologically. October 17, 2015 July 16, 2017 CurtisComments are off for this post. Ethics, no mater how grounded in some mythical “virtue”, are culturally agreed upon. Call it a social contract if you like or just “common sense”, but either way, ethics are at their root an agreement. Some ethical agreements exist in a culture and all derivative sub-cultures. In Western culture this may be represented through norms regarding murder and suicide. Human life (because Western culture is a human-supremacist club) is considered to have some special intrinsic value, no mater how poorly lived the life or how much harm preserving the life could cause. Subcultures have variations in what is valued and what is considered ethical. How do the ethical variations between a subculture and its parent culture interact? Is there a specific boundary-space where there is room for some form of mutual respect for ethical differences? Are the ethical desires of the parent culture to be imposed on the subculture despite their different values? Under what circumstances does a subculture gain enough legitimacy to have its ethical code respected? Is the cultural legitimacy of a subculture a requirement? Beyond these questions of the interaction between culture and subculture I wonder about what creates a cultural authority that will permit the enforcement of an ethical code? Is it just a general agreement? If majority wins for the agreement, where does that leave the minority? March 19, 2015 July 16, 2017 CurtisComments are off for this post. To summarize succinctly Shaviro’s argument in this week’s reading: Modern digital video is different from historical analog cinematography. This analysis might be an over-simplification of the argument, but at a basic level it holds. The issue is what that difference means for the ability of video (general term to catch “film”, cinema and related time-spanning visual media) to be an accurate representation of the artist’s intent. There seems to also be a struggle between the agency of the subject and the liberty of the artist to “create” with the image of the subject. The move to digital manipulation gives the artist god-like power to do whatever it can imagine with the image of the subject (and at a symbolic level, to the subject itself). The Grace Jones video displays a subject in flux, almost fluid in lack of conformance to a single state. No context is given to suggest whether the subject consented to the fluid state or if the fluid state is an adaption to some type of need (or force) to conform. The images could be read as calm transition between states, escaping a monolithic form, to seek a fluid existence between concrete spaces or as a subject forced to be fluid and unable to retain a desired or true form. Through the use of digital manipulation like is used in this video, it is impossible to determine as the form is so distorted that the image is helpless to represent itself in any way resembling a full embodiment. It is as though the body/subject is a puppet being pulled with digital strings wherever it is directed. At first I wanted to construct the fluidity of the form to something resembling the queer idea of fluidity, but it is unclear as to the willingness of the form to accept the various distortions that are placed upon it. How can the agency of the body be determined? Shaviro implies that it is a willful dissociation from identity, but I do not feel compelled to agree so easily. If the video was recorded in one form and the changed to something else, then at what point is the consent of the body considered? I have a lot of questions, but not many answers. Shaviro, Steven. Post-Cinematic Affect: On Grace Jones, Boarding Gate and Southland Tales. April 28, 2014 April 29, 2014 CurtisComments are off for this post. Gender performance is dictated through social norms and expectations. Judith Butler calls this enacting of a specified gender role “performativity”. Various social science perspectives on deviations from the gender binary predict that non-conforming identities will be disciplined and either corrected or rendered as stigmatized. Research and theoretical efforts tend to support this conclusion for outward identity deviations. There is minimal research regarding a deviation between a person’s accepted gender identity and their perception of the quality of their performance of that identity, except in cases of ego-dystonia. Are there behaviors that are linked to gender that are performed to correct, augment or strengthen a person’s internalized gender identity that are not linked to an external assessment of gender identity? In terms of the gender binary, for this type of behavior to exist, masculinity would have to be constructed as a more vulnerable identity than only “relentless repudiation of femininity “ (Levine 13). Theorizing this type of behavior problematizes concepts of a purely social gender identity, however, it does not necessarily advocate for gender as an essence either. One site of behaviors that can augment the gender identity or potentially change the meaning of the identity is power-exchange relationships. Such relationships often exhibit roles that are contrary to standard gender norms, but yet do not encourage acceptance of alternative gender roles. What is the impact to the internalized identity of the participants in these types of relationships? April 14, 2014 CurtisComments are off for this post.